I know the blog name paints a pretty clear picture of my time management situation and no one really wants to hear me talk about how I can't find time for things like picking up last minute gifts for friends. But.. I'm going to say it anyway. 'Hopping' in the car for me includes but is not limited to feeding the baby right before leaving so she won't scream in the car seat she hates (often while walking through the house using my free arm to herd older child), packing snacks and the rest of the diaper bag, managing diaper and last minute potty stops, etc. then dressing and hauling two kids to the car who might otherwise still be in pajamas. All this to drag them to a store to shop for a gift for someone where they'll sit in a cart or stroller waiting for me to amuse them while I try to find the perfect item as fast as possible. Sound like fun? If it sounds familiar we both know the answer to that question! Instead of the fun time described above, I chose to make a housewarming gift for a friend this morning and I think it's cuter than what I could've just picked up at the store! 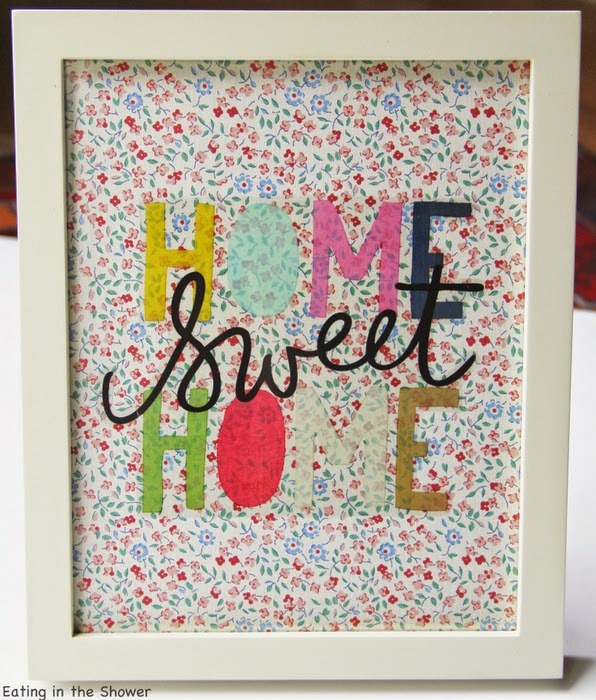 I used a 5x7 frame without its matte, cut flower patterned scrapbook paper to fit, and applied a 'Home Sweet Home' sticker from the same package of stickers that I've been using for the projects around our house that I showed you here and here. I made this framed Home Sweet Home 'print' very last minute using items I had on hand while the babes were still sleeping. Although it might seem like it should be easier to run out and pick up a gift last minute, making something from what I had at home actually saved me time and the results are (hopefully) a gift that stands out from others. There may be days where all I can manage for a last minute gift is a bouquet of flowers but until then, I'm crafting one! This is so cute, Kate! I wish I was someone who crafted a lot, if you have the stuff and a good imagination like yourself...voila!! And my friends and family love homemade gifts.